I have been admittedly at a lack of words, and quite frankly motivation, at updating my journal the past few weeks. 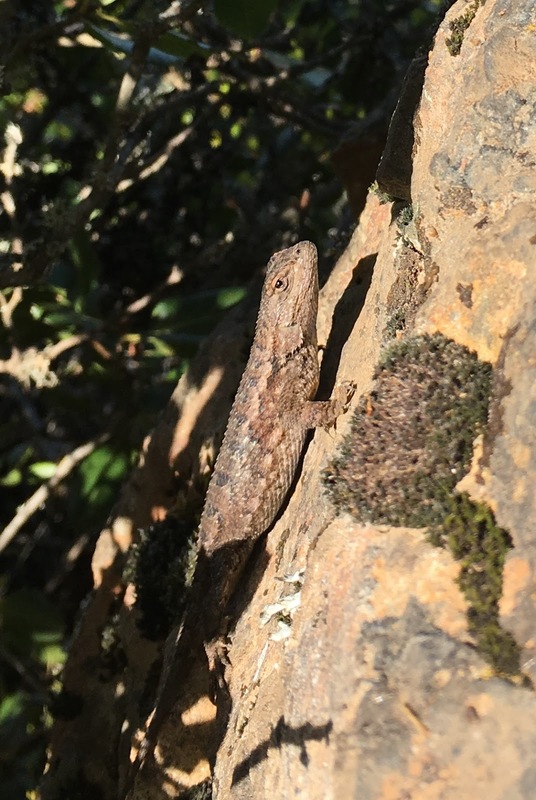 I find every time that I sit down to my computer to write up my recent experience at Miwok (and now subsequently at Mind the Ducks AND 3 Days at the Fair), that I just can't seem to focus my thoughts. This past weekend as I was making laps around the course at 3 Days, I had a chance to catch up with many of my running friends and acquaintances. One thing that I noted during my many conversations was that several different people made mention of this very journal and the race reports therein. It's a bit weird, because I always just thought that no one really was reading any of these silly words that I put up here. What's more, is that several people noted that their favorite posts of mine weren't actually the race reports, but rather my goofy geographical ramblings. Hearing this really did warm my heart. 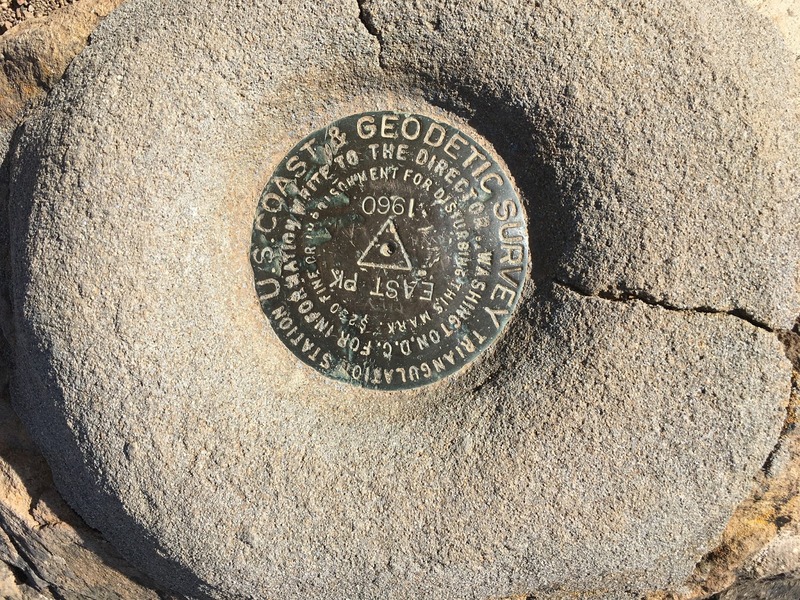 As much as I do enjoy recapping a great race, I simply love posting about my other adventures, geographical oddities, or ice-related interests. One friend of mine actually told me that his son read my "Arctic Circle" post and couldn't stop talking about it. That was probably the most profound and moving compliment I've ever received about this journal site. The downside to all of this is that it has somehow left the me feeling that all of my posts should be well thought-out, full of profundities and waxing poetic on life philosophies. I should be posting meaningful thoughts and experiences...full of purpose and self-discovery....blah blah blah. I can remember when I first started writing on here and many of my posts would simply be a few sentences related to some mundane banalities of my life....and I was ok with posting that. I didn't care if my post lacked any deeper meaning. Somehow now though, I feel an obligation to at least write something meaningful. Over this past month, my running has reached an incredible peak...and arguably way too fast. Combined with my streak (now at 150+ days), my weekly mileage totals have only increased...and this includes back-to-back-to-back race weekends. Too much...too fast. My time out at Miwok as incredible, and the course was utterly sublime. At Mind The Ducks, I again had a wonderful time running loops in my home town and visiting with my sister and my little nephew. But this past weekend at 3 Days, I was disconnected, and felt alone. For the past 4 years, I have attended 3 Days at the Fair and participated in the 72-hour event. Each year I've done better than the previous and have subsequently racked up nearly 1000 total miles on the course (982 total before this year). This year, the Race Directors announced they'd be introducing a 6-day event, and as much as I do want to try a 6 day at some point, this year was not the year. My heart wasn't feeling the 72 this year though either. Taking a page out of fellow 3-dayer Darren Worts's book, I opted to instead do the "Quadzilla". The Quadzilla consists of running four marathons over the 72 hour period (1 on day 1, 1 on day 2, and 2 on day 3). This way I figured, I'd be able to hang out over the entire weekend, but still get to run 100+ miles. In addition, I'd get some nice breaks in between to just kick back and hang with folks and crack my 1000th mile. I'd even get a cheap motel room down the road to crash in during the race so that I didn't have to sleep in a tent. Lastly, there's a special unique coin for the Quadzilla that I'd be eligible for which would a nice addition to my 3-Days collection. It all sounded great on paper. But in reality, the Quadzilla proved to be very unappealing and honestly quite unfulfilling. Every time I was out there running, I felt like I was an annoying guest on a course not meant for me. The real runners were the multi-day runners, and I was just occupying space. I felt like other runners were thinking "when are these marathoners going to be done so that they clear off of the course?". I know in reality it wasn't like that. My friends were pleased to see me, and I did spend a lot of time hanging out with people, but my overall feeling coming away from the weekend was that I was the "Odd Guy Out". In a sense, I wasn't really part of the 3-Days family this year. When I did manage to complete my 1000th mile lap on the course, there was no fanfare, and honestly it felt incredibly underwhelming. It's not that I was expecting much, but I was at least hoping to feel something. I've run with many on their 1000 mile lap and I was always so jealous, but this year it went by as just another mundane lap on a particularly hot/humid day. After the weekend was over, I stayed for the awards ceremony so that I could proudly accept my 1000 mile lifetime coin. In the crazy shuffle of paperwork and prizes though, my name had slipped through the cracks and I did not receive any award. I did go up to the RD's afterward and they apologized profusely and did give me my awards, but again, it all just compounded the incredibly underwhelming feeling of it all. I guess I just didn't feel like part of the family this year, and it made me a bit sad. But...the good news in all of this is that I tried something different, and came to realize what it is that I love so much about 3 Days, and why it's so special to me. Come next year, provided I'm again healthy, I will most certainly be headed back to run in a multi-day event at 3 Days (and not the Quad). "Not sure who of you watched the most current re-imagining of Carl Sagan's Cosmos, but there is a very poignant monologue of Carl's that they left in as a tribute. That monologue was called the "Pale blue dot" and was meant to highlight just how small and insignificant we all are. There was a photo taken of Earth by one of the Voyager space crafts as it was exiting the solar system. Earth appears as only a tiny speck...a "mote of dust" as Carl calls it. He goes on to tell us that every person that has ever lived....ever, is somewhere captured in that photo. It is a profound thought. Taken form the Apollo 11 Command Module as Neil and Buzz were returning from the Moon's surface in the Lander. Earth, only half-lit in the background of course. 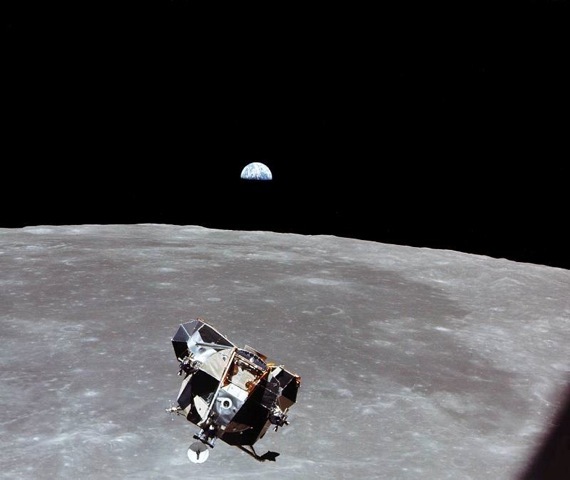 "At the time this photo was taken, every person that has ever lived, Ever...in the history of the Earth, is somewhere in this photo.........except Michael Collins." It really is a matter of perspective though. Sure Michael was the "one guy left out" of the photo, but I think being able to say you took that one picture of "everyone else" is pretty awesome thought." After not getting selected to run Western States this year, I knew I'd need another qualifier. 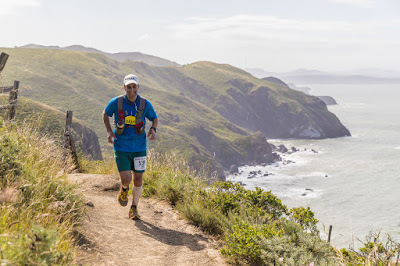 While I was still vacillating over which 100-miler I wanted to run over the Summer, I decided to throw my name in the Miwok lottery hat (a race I've had on my bucket list for some time). 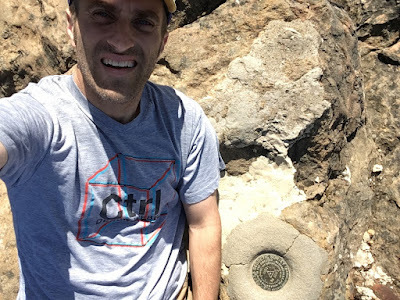 Somehow, my name was drawn and since January, I've been eagerly awaiting for May to roll around so that I could run along the beautiful and picturesque coastal trail in the Marin Headlands north of San Francisco. To say that this course is lovely, splendid, sublime, magnificent...(choose your superlative), would not do it justice. It is a magical course that literally had me smiling the entire day. Throw in perfect weather, and being crewed by my other half at the aid stations....and it was nearly the perfect race. I say nearly because there was one tiny annoyance with the event, but it only came about due to my own lack of situational awareness. The start of the race only features about 1/4 mile of road running before starting up a very steep and narrow single-track climb. I was late to the starting line and just figured "I'll start in the back of the pack". Well, needless to say, I got stuck in a very slow conga line of easy-paced hikers up the first 2 mile climb. This meant my first two miles were at 17-min pace and overall much slower than I'd prefer. Perhaps it was a blessing in disguise though as it forced me to not go out too hard or too fast. By the top of the climb, I was able to open up and run comfortably and within a few miles forgot completely about the start. Other than that small annoyance, the race was perfect. I had a practical goal of going sub 13-hour, with a more aggressive goal of going sub-12. I knew it would be tough, and I didn't want to completely blow up...but I was also going into the event with a lot of training miles under me. I was ready to race a bit. I bombed the first descent (perhaps a bit too fast), and felt good through the first mini-loop (about 13 miles). Lots of ups and downs as the sun rose, and I just couldn't believe how beautiful my surroundings were. I was practically giggling. I kept saying to runners as they'd go by..."not a bad place to be on a Saturday morning, no?" The day only got better as the miles went by. I fell into an incredibly comfortable groove and I could tell all the training was paying off. Still, I wasn't necessarily used to so much climbing. I eventually made my way through the first two "mini loops" and was back at the Tennessee trailhead at mile 26. As you can see from the pictures, I was still feeling great, and smiling quite a bit. A few miles later, I'd top out above Pirate's Cove and the photographer would get a picture of me that pretty much summed up my entire feelings of the day in one snap. View of Coast Trail along the course. The next portion of the course as probably my favorite. You spend about 10 miles cruising along the coastal trail, working your way in and out of various drainages and long grass-covered hill sides. It was absolutely breathtaking. At mile ~43, I entered the forest and was immediately shaded by the enormity of Sequoia trees. The trail followed the Bolinas ridgeline for about 6 miles until it finally dropped down at mile 49 to the turn-around aid station. There I was greeted by my other half and was finally starting to get tired. I remember saying, "this course is beautiful, but I'm getting tired and I think I'm about ready to wrap this up". The final miles were long, but I checked them off as best I could. When I made it back to the Bolinas aid station at mile 55, I knew I was on the homestretch with mostly downhill running. I checked my time and realized that I was almost exactly on 12-hour pace. Wow! I actually hadn't realized I was doing that well, and now had the fire lit of trying to eek it in under 12. I knew it would be really close though. I picked up the pace a bit and did as best I could. I was definitely tired and sore though. As I neared the final descent, I thought I had sufficient time to easily finish sub 12, but unfortunately, I had miscalculated where I was. It was actually still another mile before the turnoff for the final descent. Once I came to this realization, I had essentially given up on the possibility of a sub 12. Still, I started running as hard as I could, and even passed 5 runners on the descent. I kept checking my watch, but as it ticked down to 5 minutes...then 3....then 2, I figured the sub 12 was a lost cause. But then with about 50 seconds to go, I popped out of the woods and could see the finish line. I couldn't believe it. I sprinted as fast as I could and crossed the line in 11:59:35. Hell yeah. That was a very hard-earned finish, but one that I was absolutely I thrilled with. Honestly, Miwok was about as close to a perfect race as I can remember having in a long time. Beautiful scenery, perfect hydration and nutrition, zero issues, and great weather. Other than the slow conga line start, everything went perfectly and I came away from the run ecstatic at the entire experience. The next day, I was rightly sore, and chose to spend the afternoon with my other half enjoying the Marin Headlands. We hiked over to a ranch along the coast and played with goats, and then later hiked up Mt. Tamalpais to the summit (known locally as just Mt. Tam). 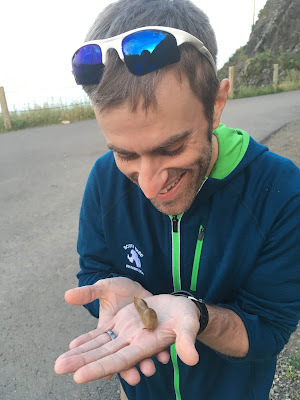 Later that evening, we drove out the to the Point Bonita Lighthouse where we watched the sunset and played with banana slugs. What a perfect mini vacation. Thank you C and L for coming to cheer me on and crew for me at the aid stations. It was so nice to see you both during the race.